Delta Kits just provided a training class in conjunction with the 2013 Mobile Tech Expo in Kissimmee, Florida. This was an excellent opportunity that gave technicians hands on training in a professional environment. A special shout-out to the newly trained forum members bill lambeth, kscreel, and Timh. Thanks Delta for a great training class! Korey and Bruce are awesome people as well as trainers! I too would like to thank Delta Kits for the training class.Bruce and Korey are top notch.The small class size was great for getting one on one instruction.I would highly recommend this trainining to anyone interested in wsr. Thanks to Korey and Bruce for an excellent training/certification class. After attending the class we are more confident not only in repairs, but how to talk with our potential clients. I highly recommend this class!! Thanks again! 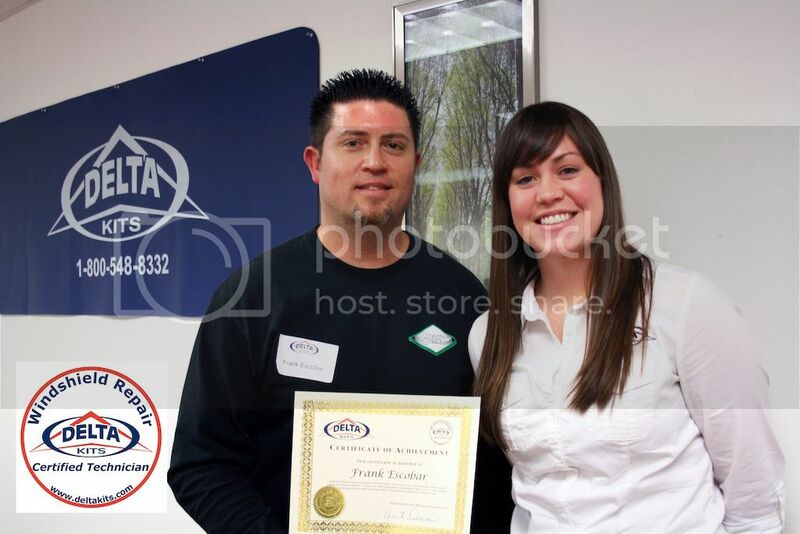 Congratulations to Frank on his recent accomplishment of becoming a certified windshield repair technician. On behalf of everyone here at Delta Kits Inc., I would like to sincerely congratulate everyone on their recent accomplishment of becoming a Delta Kits certified windshield repair technicians. We would like to extend our congratulations to the latest group of Delta Kits Certified Windshield Repair Technicians. Congratulations to this month's Factory Trained & Certified Technicians. Well done guys and girls! We would like to thank everyone at Delta Kits for the great training they provided my daughter and myself. Getting the hands on training and having the experts to provide guidance and best practices was worth the two day drive. The free lunch was a nice touch also. We were pleased with the friendly and professional group of people we met at Delta Kits. On behalf of everyone here at Delta Kits I would like to sincerely congratulate everyone on their recent accomplishment of becoming a certified windshield repair technician.